Bermuda boasts a rare native population of non-migratory Monarch Butterflies which researchers believe had become established here by the mid-19th century. But the island also receives occasional visits from migratory North American Monarchs, known for their epic Winter treks across the continent to warm-weather locations in Mexico. The regal Monarch Butterfly has bright orange wings with wide black borders and black veins; its hindwing has a patch of scent scales and white spots on its borders and apex. The typical wing span is 3 3/8 to 4 7/8 inches. The Monarch caterpillar has alternating yellow, white and black stripes. The caterpillar feeds solely on the leaves and flowers of Milkweeds; the butterfly feeds on nectar from Milkweeds as well as other flowers. 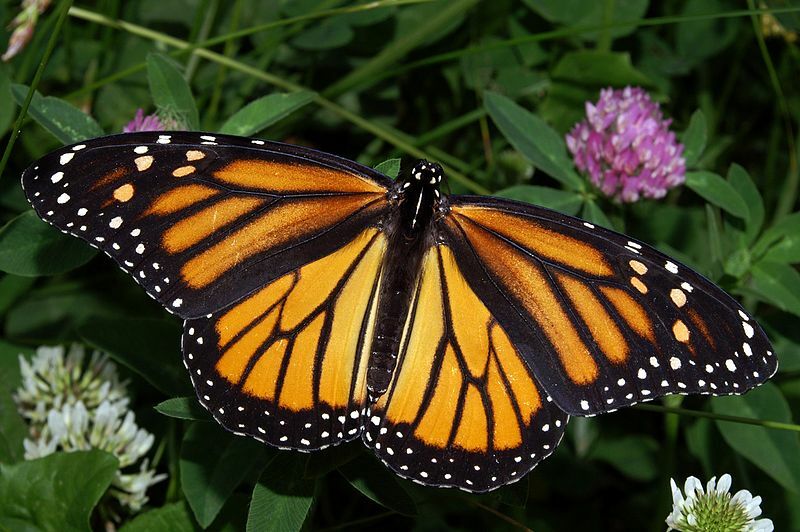 The Monarch Butterfly’s preferred habitats in Bermuda include fields, gardens, meadows, weedy areas and marshes. Bermuda boasts both resident and occasional migrant populations. The local population was noted as early as 1847 when a population was seen breeding all year. According to the Bermuda Zoological Society, specimens from the migratory American population are seen here occasionally. One of the few insects capable of transatlantic flight, these adults make massive migrations from August-October, flying thousands of miles south to hibernate along the California coast and in central Mexico. A few overwinter along the Gulf Coast or South Atlantic coast. Along the way, Monarchs stop to feed on flower nectar and to roost together at night. At the Mexico wintering sites, butterflies roost in trees and form huge aggregations that may have millions of individuals. During the winter the butterflies may take moisture and flower nectar during warm days. Most have mated before they leave for the north in the spring, and females lay eggs along the way. To attract Monarch butterflies to your garden, the Bermuda Zoological Society advises you plant the yellow and red-flowered Bloodflower, yellow-flowered Butterfly Milkweed and the white-flowered Ballonplant.